There is a lot to get through this morning, so we'll plough straight in with the news that Stan Kroenke has spoken with the Daily Telegraph, although the story as I write is not on their website. Apparently it's on a 7am embargo - who ever thought that a website might be a good place to break your exclusive rather than have your rivals do it for you? Thankfully for us early risers I can bring you quotes which have been lifted from the print edition of the paper and used by The Guardian and the Daily Mail. "With Arsene, it’s his decision and only he will know that. He is one of my favourite people I have met in the last 20 years. He is a great person and I love the way he handles himself. I love his focus. "He is a very intelligent guy. You can talk to him about anything and, when he starts talking to people, I really love to listen to him. He should hold seminars. "I have tremendous confidence in him. He is one of the great managers in the world. Arsene’s our man." "It's a rocky start but what do people really expect? Cesc Fábregas [who signed for Barcelona in the summer] is a great player who Arsène developed from the age of 16. He decided last year that he wanted to leave. "Maybe it is one of those times when we have to work our way through, maybe with some young players. Arsène has been really good at developing these guys, people like Alex [Oxlade-]Chamberlain and Jack Wilshere. There are some really good players that Arsène thinks can be special." "I like the kid [Fábregas] but I'm not going to change his mind. Arsène made the decision. "I also get it on [Samir] Nasri [who joined Manchester City]. If we didn't do something on Nasri people would be looking at us next summer and saying, 'Why didn't you do this?' We bought in a lot of resources that we can use on other players." If you didn't already know, today is the 15th anniversary of the club appointing Wenger as manager. Who would have thought all those years ago we'd have come as far as we have under the Frenchman. His achievements with the club can't be questioned and Kroenke is right in my opinion that only Wenger should decide when the time is right for him to move on. Something which Bob Wilson is very much in agreement with, speaking to The Sun about Wenger's situation at the club. 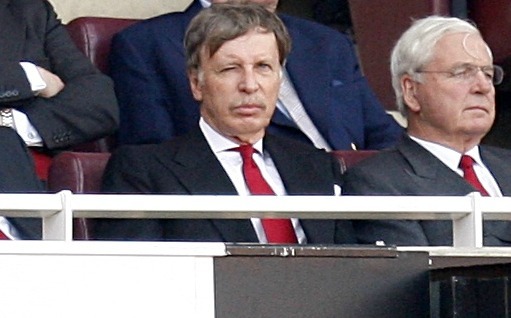 The Telegraph interview gives an insight into Kroenke's dealings with the club. By the sounds of it he's not in contact with Ivan Gazidis on a day to day basis but does have involvement on a strategic level. However it appears that Wenger is very much in charge of transfers, although I think that he would have kept Nasri rather than let him go to Manchester City had the board not pushed him into selling him. So with the AGM on the horizon, we hear from Kroenke for the first time. However we're still yet to hear his voice. Perhaps he'll give the site twenty minutes of his time when he's over to attend his first game as Arsenal majority shareholder. And talking of the AGM, the accounts which are due to be published later are expected to reveal the club has made a profit, although not a large one according to City AM. The Guardian are reporting that Manchester City are looking at Robin van Persie as a possible replacement for Carlos Tevez. Whilst the Daily Star say the Arsenal captain has told friends in Holland that he is waiting to see who we sign in January before committing his future. The early team news ahead of Sunday's north London derby is that Theo Walcott, Gervinho and Laurent Koscielny will all face late fitness tests ahead of the game with Walcott and Gervinho more likely to feature than the Frenchman. Yossi Benayoun is back in training and could make the bench and also back on the pitches of London Colney is Sebastien Squillaci, who is very short of match fitness. And speaking ahead of Sunday's match Per Mertesacker is looking forward to his first NLD. "This is my first special game for Arsenal. "A lot of people have been telling me about it, how massive it is, and what a special experience it is and I am looking forward to it. "It is an especially important game for Arsenal and for me. There is nothing similar to it in Germany. "You cannot compare Bremen against Hamburg because they are not quite in the same city, so the London derby is bigger." It will be a big test for him on Sunday that's for sure because we all know that Adebayor will want to put one over us. But he's proved to be a steady signing. He's done well in the games he's played in and I can't think of that many errors he's made. But Sunday will be his biggest test and I hope one we'll come through with flying colours. Also hoping to get into the team is Alex Oxlade Chamberlain, who wants to take Theo Walcott's place from him. The manager is due to speak to the media at lunchtime so we'll get more of an idea of who will be in the team and who won't be. It will also be interesting to hear him react to what Kroenke has had to say. For some extra reading take a look at our latest Inside the Formation post which focuses on Mikel Arteta's role against Olympiacos. And finally, congratulations go to Jack Wilshere who yesterday became a father for the first time.